Acela Express Cross-Lit on the Draw. Yes, I’m trying to pick a title that will get you to read this post. Exposed digitally using a FujiFilm X-T1 with 18-135mm lens. To make this photo work, I had to carefully mind the shadows from catenary poles so they didn’t appear to intersect the sloping face of the Acela Express train set. In late April, I made this trailing view of a Boston-bound Acela Expresstilting train crossing the former New Haven Railroad draw bridge at Westport, Connecticut. By working from the outbound Metro-North platform in the evening, I cross lit the train for dramatic effect and to better show the infrastructure. Cross-lighting, is when the main light source (the sun in this case) primarily illuminates only the facing surface of the subject, while the surfaces are bathed in shadow. This presents a more dramatic contrast than three-quarter lighting, which offered relative even illumination across the subject. Cross-lighting is often most effective for railroad photography when the sun is relatively low in the sky. In this instance the compression effect that results from the long telephoto lens works well with the cross lit train. Exposed digitally using a FujiFilm X-T1 with 18-135mm lens. 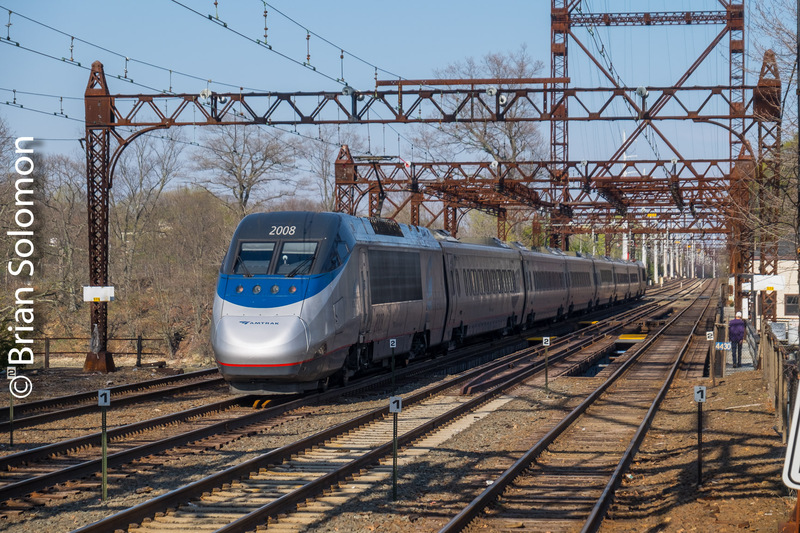 To make this photo work, I had to carefully mind the shadows from catenary polls so they didn’t appear to interect the sloping face of the Acela Expresstrain set.